"Hey who lit the candle?" asked the newly awakened mouse in a small squeaky voice. "I don't know, but I wish they would turn it off. Don't they know I have to wake the sun up in the morning?" yawned the old Red Rooster. Mr. Rooster was not in a good mood most of the times, but at three o'clock in the morning he was positively grumpy. Little lamb, nestled warm and snug next to his mother Mrs. Ewe, stirred and opened a sleepy eye. "Hey," he said. "What's going on Mama? Why are all these people in our home?" . Mrs. Ewe gently nudged her sleepy son and gave him a loving kiss on the top of his little head. "I don't know son, but if we're all very quiet and we listen carefully, we may find out." Little lamb listened to the people talk, and he was very quiet indeed. "Perhaps it has something to do with the fact that the gentle looking woman over there is about to have a baby." his mother whispered into his ear. Little lamb's eyes grew wide with wonder. "When will the baby arrive?" he questioned his mother . "Is that why she's so fat?" he inquired. "Shhhhh" answered his mother "We'll talk about that later," she told him. Over in the next stall Mr. Donkey snorted and woke up. "What's this I hear about a baby?" he inquired. "Hoot! Hoot!" answered the wise old Owl from his perch high above the others. "That lady down there, she's having a baby," he announced importantly. "Wow, let me see!" exclaimed the Donkey, as he leaned over the railing to take a closer look, "I've never seen a baby being born." "Oh get your head back" scolded the Owl, " You'll probably slobber all over the poor little thing the minute he arrives." Mrs. Ewe looked at the other animals, "BE QUIET! she said sternly, "Don't you know that at a time like this a woman likes to have quiet?" Sloppy Pig raised his head from his 3:00am snack, "And just how would you know?" he asked with a grunt. Mrs. Ewe tossed her head with an air of importance. "Well... I AM a MOTHER," she said, "And we women do have a sixth sense about things like this." Sloppy Pig just grunted and went back to his snack. "Well, I just wish he would hurry up and get born so somebody would put out that candle," Mr. Rooster grumbled. Little lamb looked puzzled, "You called it a "he" Mr. Rooster," he said. "What makes you think it's going to be a boy?" "That's easy," grunted the Pig, " Look at all the people who came to see the birth. Certainly nobody would pay THIS much attention to the birth of a little girl baby." "Well why not?" asked Little Lamb. "Child don't you know anything?" inquired the Pig, "Because girls are not important, that's why not," he growled. "Girls are too important," said Little Lamb defensively, " My Mama is a girl and she's very important," he insisted. "Well, I'm not so sure that's true, the Pig grunted, "But nevertheless, with all this excitement I still bet it's going to be a boy." "You, sloppy Pig, are just a grumpy old chauvinist," said Mrs. Ewe, stamping her tiny foot for emphasis. "That's what you are all right," she sniffed, "Just a grumpy old chauvinist Pig!" "Mama, what's a chauvinist?" interrupted Little Lamb. "Never you mind son. Just remember," she said decidedly, "HE'S ONE!" "Well, while I hate to get into this." said the wise old Owl, "I do believe that in this case the sloppy Pig happens to be correct. About the boy part I mean. Do you see those three men over there in the corner who have just arrived? Look the one in the middle holding the BLUE package!" "You mean the package that smells funny?" piped up squeaky mouse. "And just how do you know it smells funny?" asked wise old Owl. "Well I uhhh...I was sniffing the air to see if anybody happened to bring along some cheese, and my extraordinary nose picked up a strange scent that is definitely not cheese!" "The Owl sniffed the air. The mouse was right, it was definitely not cheese. "Hmmmm. It smells to me like Frankincense," said the Wise Old Owl, "Well, well, well," he said to himself..."That is a special present indeed!" he marveled. "But look at the outside of the package it's in," he instructed his friends. "Don't any of you see what I'm taking about? he inquired. Don't any of you see it?" he asked again in amazement. "See what?" asked the Donkey. "Yeah, see what?" inquired the Pig. "The package wrapping!." said the Owl again. "Well what about it?!" inquired the Donkey and Pig in unison. "IT'S BLUE! Can't you see that it's BLUE?, exclaimed the Owl. "And if it's blue, they must be expecting a BOY baby!" "Mama what's the blue color got to do with anything? Is that the baby's favorite color?" asked Little Lamb. "I know," sighed the Lamb again. "You'll explain it all to me later." "LOOK! LOOK! LOOK!" cried the Donkey suddenly. "Oh MY," said the mouse in awe. " Look up in the sky everyone! That beautiful star overhead... why, it's beginning to sparkle and glow!" A moment later the mouse turned his attention back to the tiny miracle that was taking place right there next to their own straw manger. "Well... will you look at that," he whispered softly to his friends. "The child is coming into this world right NOW!" "WOW" was all Little Lamb could say. 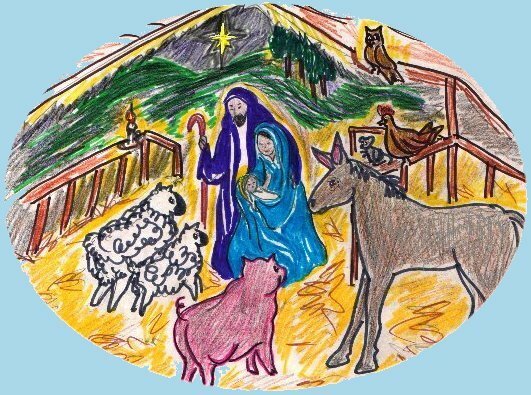 All of the animals in the stable stood silently as they watched the birth of the baby. "See, I told you it was going to be a boy," said the sloppy Pig, with a happy I-told-you-so smile. "My, my, my, that must be some special child all right" said the wise old Owl, "Why just look there!" he said, nodding towards the three newcomers who had stepped forward. "Those three men... goodness... they're dressed like kings, aren't they?...yet they're here among us, kneeling in common straw next to this tiny little child." "Why... I do believe they're praying." whispered the Donkey to Mrs.Ewe. "Mama, what's praying?" asked the lamb. "I know," the lamb sighed again. "You'll tell me later. Boy, is that going to be one long conversation!" "You know, I'm not quite sure what all this is about, my friends," said Mrs. Ewe quietly, "But I do believe we may have witnessed something VERY, VERY SPECIAL here tonight"
"You know...I think you may be right," nodded the Donkey, "People may be talking about about the birth of THIS little child for years to come," he agreed. "Goodness Gracious Sakes! ENOUGH ALREADY!" said the cranky Rooster, "If you have all had ENOUGH CONVERSATION for one night, could somebody PLEASE BLOW OUT THE CANDLE, so we can all get some SLEEP!" And so, my friends, should you.